Professor Goh Tae-yun is the husband of Hong Sun-yi, a teacher at the school where I worked. Sun-yi was astonished to hear my stories about tea. She had no idea a foreigner would be into tea. So she arranged for me to meet her husband, whose job it was to profile Buddhism and Taoism for his research in religious studies. He used his position to travel throughout Asia studying his secret fetish: Tea. The evening stunk of haste, for I had planned to get together with non-Koreans after work and had not expected this invitation. Nonetheless, my meetings with Korean teachers always took the front seat to any involvement I had with the foreign community, and most people knew this. I was the Waygook-Hanguk Saram. Professor Goh picked me up from the elementary school where I worked and stopped off quickly to his University for a package. “So you like the Fwer tea?” he mused. 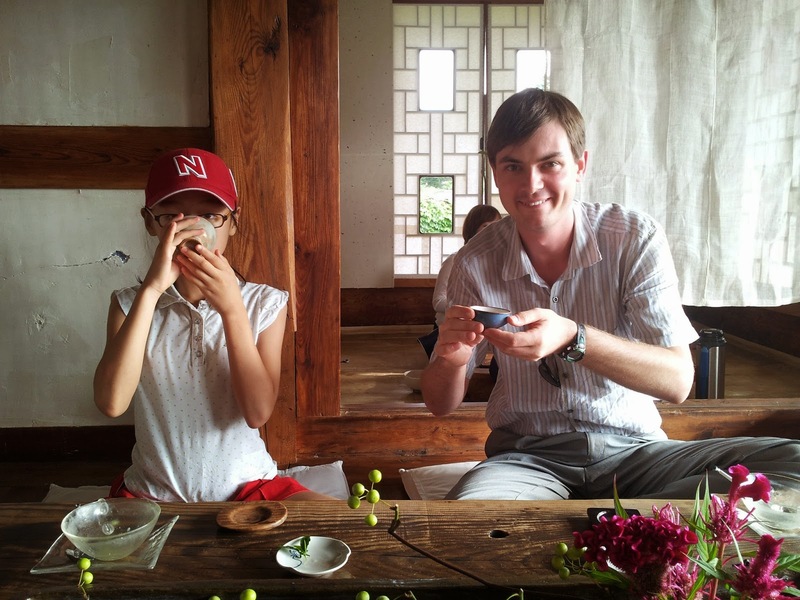 So he learned that I had discovered pu-erh in Insadong, and enjoyed the tah-do tea ceremony in Gunsan. He was happy to be among such company, an english speaker who also had a taste for tea. At his home, he practiced tah-do. He even donned traditional Korean clothing for the occasion. It was a shaky tah-do, though, meant more for function than form. Soon I’d had several full cups of tea, pu-erh varieties and more. He even served a special Black from China and presented me with a red pouch of it, which I humbly accepted. I was not worthy of such a jewel, one that he’d gleaned from his extensive travels through the world’s largest landmass. He had a story about gifting tea. “He went to China to meet with the Chairman Mao Se-Tung. now you know there is a tree for tea at a certain elevation, the only one capable of making this kind of tea. Only one thousand grams can be yielded in a year, and it is China’s most precious tea. Professor Goh’s eyes and mouth curled skyward together, a silent laugh and smile expressed gracefully in a glance. My coat pocket was buzzing with calls from foreigners wondering where I was. The rushed invitation to this tea gathering prohibited me from letting my foreign friends know about my whereabouts. Later, I would choose to spend time with foreign friends to battle loneliness, rather than learning the Korean language and studying the peoples’ customs. I would pick and choose, weekend by weekend, rather than prioritizing the one I preferred. Either group would accept me, and I wanted to please everybody. Truly, there was a choice to be made, of which culture I would embrace, and I made the decision to choose neither by trying haplessly to accommodate both. I slyly turned my cell phone in pocket off. We talked late into the night. I excused myself once to relieve myself of some tea and quickly message the foreigners, “Be there soon!” even though there was nowhere else I wanted to be but in this livingroom. He gifted me a white porcelain tea set, which I treasure to this day. I have gotten much use out of it, brewed many pots of Pu-erh. But I never saw the Professor again. Later, Sun-yi would arrange for me to stay at a Buddhist temple, Geumsan-Sa, where Goh Tae-yun was writing his book about Taoism. As soon as I got there, he was gone. The day I left the temple, Sun-yi brought me and her daughter out to the countryside of Jeonju, Jeollanamdo to visit a tea shop that grew its own green tea in a field below its gorgeous structure, the description of which is a novel, not a humble article. Perhaps that’s for another Tea Story. The sun beat down in the tea field as we strolled about, smelling the fresh August post-pluvial aroma, as if the whole field were a pot of tea we’d been steeped in. Professor Goh did not join us for tea. He didn’t need to. He is still in my mind years later as I sip green tea from a glass jar, an ocean, a culture, a language, two seasons and a nationality away, yet still: In-hyun! 1“Boicha” is Puh-erh tea. The consonant “프” is always “puh” but it transliterates “fuh”. In order to correct the transliteration error, Professor Goh pronounced “pu-erh” as “fwer” although he didn’t need to.